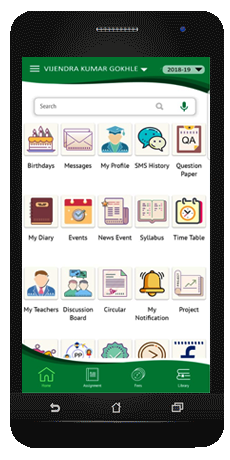 Students should bring the School Diary and other School related material every day. Students will not be permitted to borrow. Books and other belongings should be neatly labeled with the Name, Standard, Division and Roll No. The School will not be responsible for the loss of any valuable or other articles belonging to the students. - keep the School premises and grounds free of litter. Students must make it a practice to pick up food and other items that they have dropped in the classrooms. Care must be taken of all School property. Students should not scratch/damage desk/chairs/other school furniture and equipment, write or draw on walls or damage articles belonging to others. Students will not be exempted from Physical Education or other activities without the permission of the Head. Exemption will not be granted unless there is a valid reason. Students are not permitted to celebrate their birthdays in School except by way of distribution of confectionary and other like items in their respective class. Care should be taken to ensure that wrappers are not strewn around in the School premises. Students are permitted to wear a dress of their choice on their birthday. The School reserves the right to dismiss a student whose conduct is harmful to other students. Indiscipline, irregular attendance, continued neglect of studies and disobedience, are a sufficient reason for dismissal. The decision of the Head shall be binding on all concerned.